A three-quarter length profile portrait of a standing young man with hair plastered with mud into a single forward facing horn. His left arm is bound with metal rings (thiau), a practice which imitates or complements the practice of training a favourite ox's left horn across the muzzle (ma gut), both of which are often done soon after initiation. This binding is done for some months or even a year or two, and is accompanied by swelling, sores and pain, and renders the left arm useless for the period. During the elaborate telling of compliments to a woman during courtship or at dances, the youth ran a metal ring up and down the arm-rings to produce a sound. In the background can be seen numerous sandbags and a wooden framework structure next to the river, possibly a ferry crossing point for vehicles. 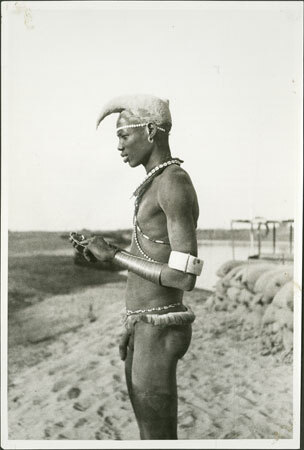 This image was probably taken among the Eastern Jikany Nuer by F. D. Corfield, District Comissioner at Nasir on the Sobat River in Upper Nile Province during Evans-Pritchard's fieldwork. E. E. Evans-Pritchard Collection. Probably given to Evans-Pritchard by Frank D. Corfield. Note on print reverse ms pencil - "[numerous printer's marks]"
Morton, Chris. "Nuer youth with thiau arm-rings " Southern Sudan Project (in development). 03 Jan. 2006. Pitt Rivers Museum. <http://southernsudan.prm.ox.ac.uk/details/1998.346.366/>.